I went on a tear with Cascadenik in May and June, here are three cool new things you can do with it. Artem, Dane and company have been diligently pushing Mapnik forward, and this spring saw the inclusion of Mapnik 2 in the newest Long Term Support version of the Ubuntu operating system, Precise Pangolin. Mapnik 2 has a variety of under-the-hood optimizations in stability and speed and an improved approach toward backward and forward compatibility, so it’s exciting to get Cascadenik back in synch with its host program. Apple’s moving toward high resolution Retina display on all its hardware, and the usual doubling of old-resolution graphics can look pretty terrible. Cascadenik now has a built-in “scale” parameter, exposed as the “2x” flag to the compile script. You can painlessly double the resolution of an output and adjust all the scale rules, generating Retina-ready stylesheets at twice the visual resolution. 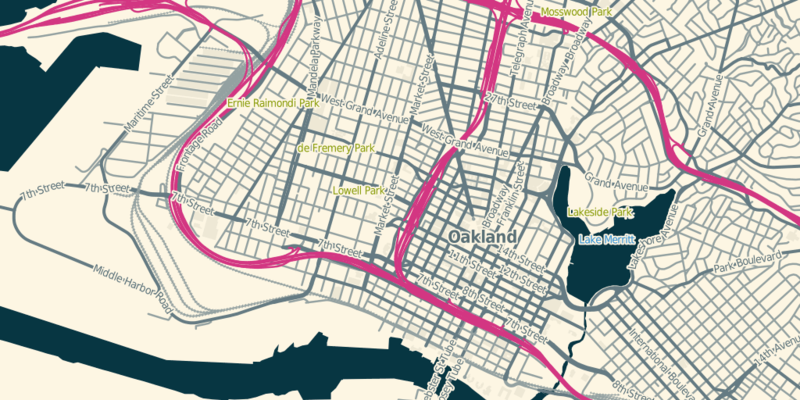 Carto picked up a few interesting features from Less-CSS, and Cascadenik now has versions of two of them. Nested rules can simplify the creation of complex styles, making it easier to build up combinations of selectors over many sub-styles or zoom levels. Check out a particularly pathological example from Toner that shows how to separate general text attributes from zoom-specific ones. Cascadenik’s interpretation of Less is a bit stricter than Carto’s, which mostly just means that you have to add a few ampersands. Variables are a simple way to group things like color or font selections in a single part of a stylesheet. While this isn’t something I use much of, it was an oft-requested feature and may make its way into Toner to enable simple customization. They work pretty much as you’d expect, taking on the precedence of where they’re used rather than where they’re defined. I’m working with Nathaniel Kelso to identify other must-haves from Mapnik to include in Cascadenik, and as always focusing on stability and interoperability with other parts of the map building stack from data preparation tools like Dymo and Skeletron to eventual rendering and serving via TileStache.